Average Weight	: 50 - 65 lbs. 4 The Hounds Basset Rescue, Inc. The Basset Hound is an old breed which is a direct descendent of the Bloodhound and has a nose that is almost as outstanding. Some sources suggest the Basset Hound may have originated from genetic dwarf dogs that were born in litters of different types of hunting hounds. 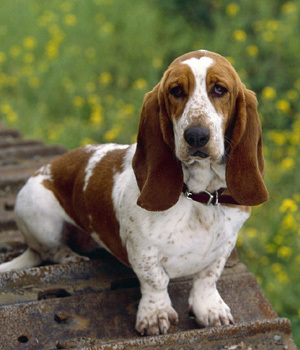 The name "Basset Hound" comes from the French word "bas" meaning low. The Basset Hound, along with our Bloodhounds, is one of our two living descendent of our earliest scenthounds, and as a smooth, short-coated dog, has a long, heavy body with wrinkly-cute, short stout legs. The Basset body form has been developed over centuries for its owners to follow the dog on foot with the dog leading, as they hunt through dense cover for badgers, rabbits, and hares, allowing the hound to hunt with its famous sense of smell. History says very little about the Bassett Hound until around the 1500s, and it was during this time that it was referred to as a badger hunter. What documentation we have during those early days shows they originated from the old St. Hubert hounds that were the hunting hounds of the abbey of St. Hubert in the Ardennes, the capital of the forests of the High Ardennes and hunting. These early Ardennes hounds were brought to Britain in 1066 during the Norman invasion, used in packs to hunt stag. The English gave the name Bloodhound to this imported dog, completely transforming this Belgian hunting dog into one the highest quality tracking dog with the most exceptional olfactory organ of any breed known to man. Later on, this breed was mixed with the later-developed Basset Hound to increase the Basset's size. Once the Basset began to gain popularity, they gathered many admirers from King Edwards VII to Shakespeare. But before then, from the earliest time of its origin until the French Revolution, information about the breed is very sketchy and pretty much undocumented. Dogs were used prior to the war that were shorter-legged and slower paced, but because of the war the dogs became extinct or dispersed. After the Revolution, the common man took up hunting with guns, using dogs they could follow while on foot. They needed a dog they could keep up with who also had a great scenting ability, and heavy bone for long endurance. With a clearer picture of history and more documentation, it was recognized that the Basset Hound was the dog to answer this need. Due to the dog's slow speed when chasing the prey, it was discovered that the prey was easier to shoot at as it provided an easier target for the hunters on foot. During these early times, four different versions of the Basset Hound were developed, with the Basset Artesien Normand looking like the present-day Basset. In the 1800s and in the 1930s, the Bassets were crossed with Bloodhounds to increase the size of the dog. From then on, the Basset Hound gradually gained in popularity, with its gentle personality and droll expression winning everyone over. With such a sweet gentle look on its face, it is no wonder that the Basset Hound's personality is sweet and gentle, with a peaceful demeanor that belies the inner strength of this four-legged hunter and tracker. Because their personality is mild, this breed has become one of the most popular family dogs, known for their extreme tolerance. A naturally well-behaved dog, they are the most easygoing of breeds with a goodnatured personality. And with such a mild disposition, many individuals take this as timidness in the breed. But its mild personality causes the breed to be very affectionate with its owner, along with children in the family. Fitting well into any family, it is cordial with family pets, children and other dogs. The only warning regarding families will be the Basset's back as if children attempt to ride on the dog's back, it will do great damage due to the length of the body. A calm dog, they love food and can easily be trained to do tricks for it. They respond well to gentle and patient training with lots of love and kindness, with positive reinforcement as they learn their commands. Unfortunately, they are known to combine stubbornness with their training program, so choosing a training program needs to be an excellent one. Once the Basset Hound acquires the scent coming from their age-old instincts as a cat crosses the street or field, or a rabbit takes off across the nearby field it will be very hard to keep the attention of this eager student unless he has been taught with high obedience training. It is important to remember that Bassets were once a pack animal, and part of a pack. Not an aggressive breed because of this pack background, they are a loving and cuddly breed with many owners referring to the Basset thinking it is a lap dog or refusing to leave the side of their owner. In several breeds the females and males will fight against one another, which is due to the dog's personality and territorial rights. The Basset Hounds are not like that as they get along well with other dogs and both sexes of their own. A major concern with the Basset Hound is obesity; not only with the weight issue but also because of the strain it puts on the inter-vertebral disks, forming a condition. Suggestions for tests that need to be done are the eyes and the blood, with an occasional checking for patellar luxation. Bloat can also occur due to their love of food, with possible lameness and paralysis due to the extra weight on their legs and spine. The coat of a Basset Hound is short, heavy, and smooth, with low grooming requirements. A brushing once or twice a week removes any dead dander hair, while keeping the skin circulated. But during heavy shedding cycles, the hair will need to be removed by brushing and bathing. The hair around and inside the ears needs to be carefully wiped and cleaned, as when the dog is hunting, drinking, or eating, debris or food matter has a tendency to become entangled in this area, causing fungus or bacteria to grow if the area is left unattended for lengthy periods of time. This is a breed that requires exercise on a regular basis due to their ability to gain weight and be on the rather "lazy side." In fact, it is a mandatory requirement, other than not being able to let the dog off the leash under any circumstances while they are being walked as the Basset will never respond to you while on a dead run after a scent or chasing something that runs. Walking them around the block just is not enough. Lack of exercise causes obesity, stress on the joints and bones, with many health problems developing. Regular exercise regimes are important to keep the health of the Bassett Hound both physically and mentally. This is a very important area to research if the Basset Hound is a breed being considered. Even though the Basset Hound is one of the most popular fun-loving breeds for families and affection, they are the worst ones chosen for intelligent and fast training not intelligent, mind you but fast. And a person will never get quick and fast results from a Basset, because they do not want to learn unless they have a good reason to. The trainer or owner needs to show them "why" they need to learn, and make it fun for them to get their attention. And for anyone who has attempted to train a Basset, they will recognize this fact instantly. Before beginning a strong training schedule with the Basset, respecting the breed may be the first big step to conquer. Once this is done, the wisdom of training this reluctant breed will be made much easier, along with the understanding of how they think and why they do what they do coming into play. Once the intelligence of the Basset is brought forth, along with recognizing that different rules may need to apply to the particular training style, both the trainer and the "trainee" will be ready to go eagerly and happily. But it will be a challenge and hard work, even with these preliminary steps already accomplished. This breed is stubborn and mule-headed once it is on the hunt. Those who know the breed know from experience that no matter how much the dog loves them, once on a hunt the dog will take off and never turn around to see if they are following. LOTS of patience while maintaining a steady and loving manner will work wonders with any breed, but this breed requires it along with persistence and sheer determination. The Basset is naturally a pack animal, along with being a "team member" as long as it is fun. Fun desiring, along with being lazy enough to want do nothing but sleep, is where the challenge will come in. The effort to get this breed off the floor or couch, while recognizing it will be fun to do what you want not what the dog wants. To do that, become the alpha dog, the leader, the boss, the one who does the commanding and will not quit. Once this is recognized, the training will begin in a successful direction to develop one of the most wonderful companions known on earth, and one of the most trusting breeds alive.